Earth Day was this week and it always gets me thinking about exploring the world we are trying to conserve. You don’t have to travel the world to give them a broad view of the world but I think that exposing them to bite size bits of other cultures through language and books can really help. 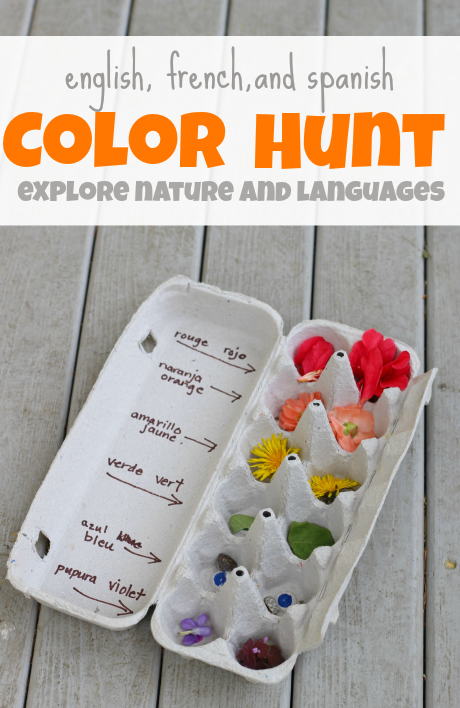 This nature color hunt activity not only celebrates the earth and its colors but it celebrates some of its cultures too by including different languages. 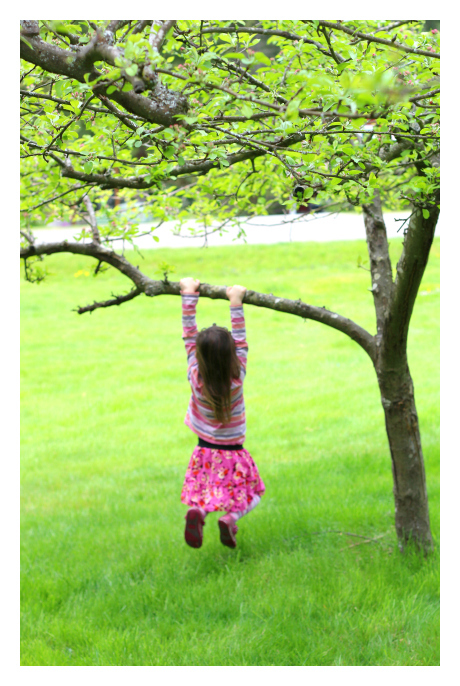 Our friends at Little Pim are partnering with me for this post and a fun Twitter Chat next week to talk about how if children learn about the world, they will care about the earth. Don’t miss it. Gather your materials. 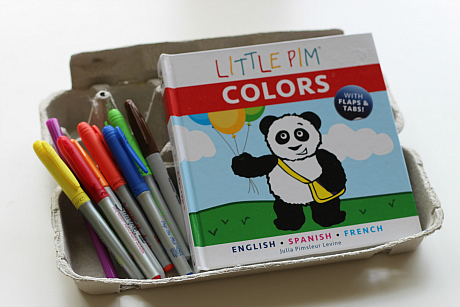 We used our Little Pim Colors book as a guide for the color names in Spanish and French. 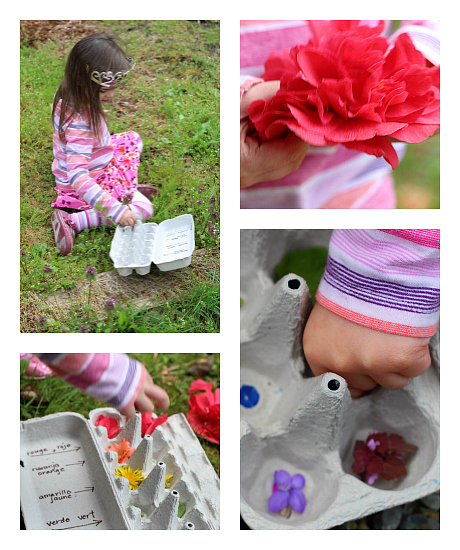 We also used an egg carton, some markers, and nature from our yard. 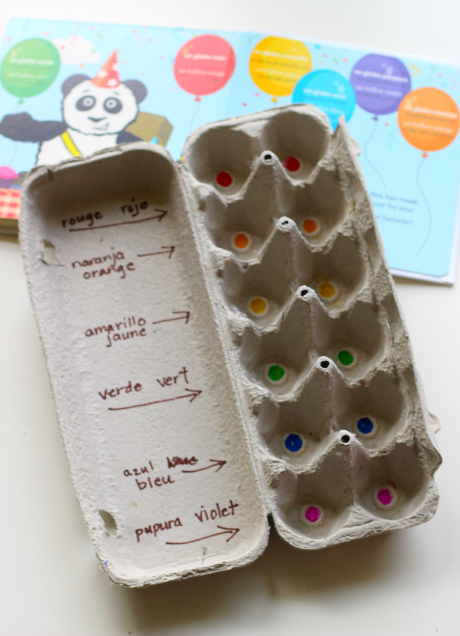 Start by coloring the inside of the carton in the colors you will be learning. We followed the colors in the book which were red, orange, yellow, green, blue and purple. 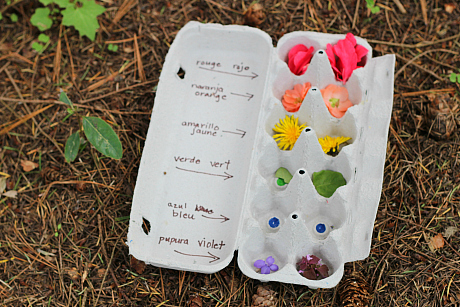 I loved that I could color two of each so my daughter could say the color one time in French and once in Spanish for each little bit of nature she popped in it. 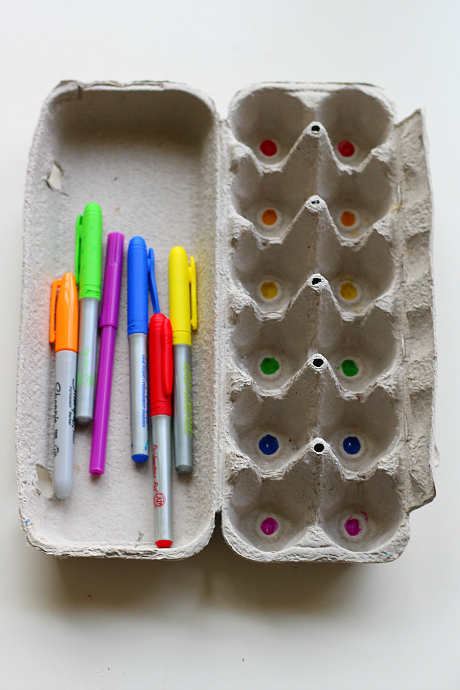 Next, write down the color word on the top of the carton next to the color. 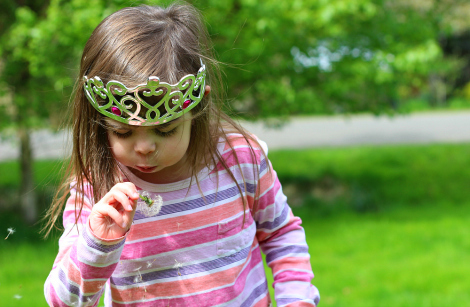 Time to gather your little learner and head outside. We are building a small addition to our house right now and I think the guy working outside thought I was insane as I took picture after picture of my daughter… I didn’t have time to explain. Look for colors by first saying the word in French or Spanish. I would say “Violet. What color do you think that is?” If she didn’t know I would point to the color in the carton and say “Look this is Violet, violet means ….” and she’d say “Purple!” and I would add “Yes violet is how you say purple in French.” We followed this pattern for most of the colors. Some of the colors she knew so this exchange would be shortened. Each time I wanted to make sure she said the word and knew whether it was Spanish or French. I did each color in each language one time. I am exposing not drilling her. Some of the colors were easy to find… some not so much. We didn’t have a spot for white in our carton but when she found this dandelion she asked me how to say white in French and Spanish. Luckily I knew! She didn’t know how excited I was to hear her curiosity grow past the boundaries of this activity. Take time to explore the nature around your home as well. We found worms, lots of spiders and, stopped to play too. Come Chat With Us On Twitter! 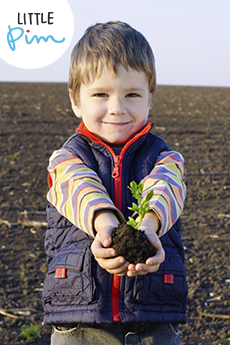 Come chat with me about how we can encourage our kids to explore and care for the earth. It wouldn’t be a Twitter event without prizes and we have some great ones. 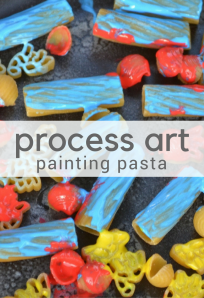 Prizes include A bunch of fun Little Pim Products and one lucky participant will win a Trio Android Tablet! Make sure to follow me @Noflashcards and sponsor @LittlePim as well as our fantastic panelists @teachmama and @pragmaticmom. RSVP HERE Everyone who RSVPs you will receive an exclusive Little Pim discount code to use during and after the party! 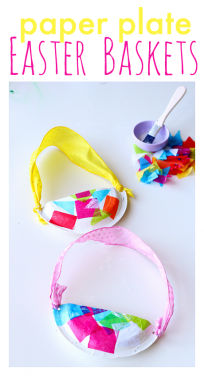 For other activities like this color hunt one, make sure to follow me on Facebook! As mentioned above this post is sponsored by Little Pim. That teach kids to learn the nature and teach them how to enjoy their life.